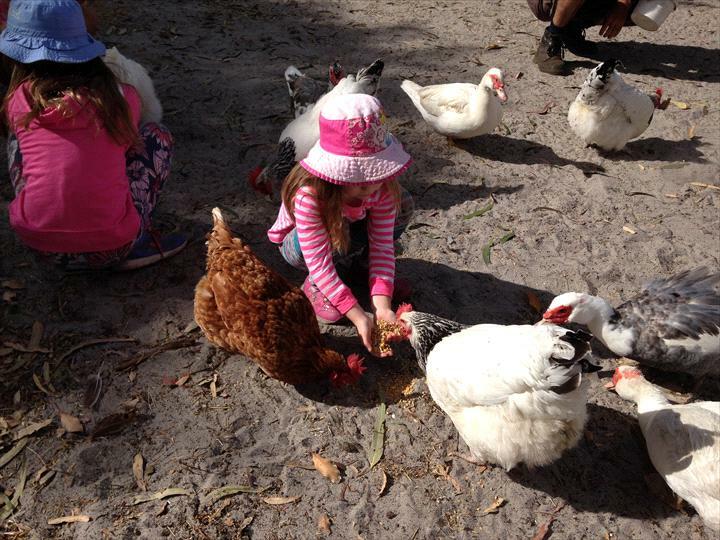 Kerriley Park Farmstay is the ultimate country getaway, great fun for the young and young at heart. 4 secluded self contained cottages nestled in a peaceful bush setting. Meet and feed the friendly farm animals daily. Relax whilst the children enjoy the great playground and pool facilities. Enjoy a bush walk or simply bask in the serenity, we are situated in the heart of the Margaret River Region close to wineries and beaches, in fact we are an ideal base from which to explore all the areas great attractions. Kerriley Park Farmstay is the ultimate country getaway. Great fun for the young and young at heart. With 4 secluded self-contained cottages, nestled in a peaceful bush setting, whilst enjoying the animal interaction experience. We have a large number of animals for daily animal feeding activities. The huge playground and pool will keep the kids busy whilst the grown ups enjoy some of the local wine and produce from the privacy of the cottage verandahs. The native bush contains over 150 species of plant including spectacular wildflowers, and is home to wildlife such as kangaroos, bandicoots, and possums, great for a peaceful walk. All this enables both families and couples to spend their days on the property. When you do want to venture out we are positioned in the heart of the Margaret River region. Most of the South Wests major tourist attractions are within easy reach of us. Good for family's, our kids loved feeding the animals, the chalets are great they have full cooking facilities and a bbq, Austin and Jo who run the place are lovely people. Location is great and hosts are friendly. Love the gentle animals there. Rooms are neat and tidy. Great experience at this awesome farm stay. The kids loved feeding the animals every morning. Cottage was cosy and plenty of room for the family plus the grandparents. Location is perfect. Basically in the middle of Dunsborough, Bunbury and Yallingup. The owners are wonderful too. Thanks for having us Austin and Joanne, was great to meet you..
Go to the end of Busselton bypass, turn left onto Bussell Highway, towards Margaret River, turn right onto Wildwood Road, then left onto Yelverton North Road, we are situated on left hand side. Booking Terms and Conditions Rates are subject to change without notice.SCHOOLIES No school leavers accepted..MINIMUM BOOKING PERIODS Long weekends - Minimum booking = 3 nights All other nights except Public holidays (as detailed below) = 2 nightsPUBLIC HOLIDAYS - Dates that include Easter Christmas or New Year public holidays. Minimum booking = 4 nights. Arrivals and departures are not permitted on Easter Sunday Christmas Day Boxing Day or New Year’s Day.OVERSEAS VISITORS must provide Passport details and credit card details when booking.CHECK-IN/OUT TIMES Check-in = 2pm Check-out = 10am (or by prior arrangement with management) PAYMENT POLICY Payment in full (100%) is due when the booking is made whether online or by telephone.CANCELLATION POLICY If you need to cancel your booking the following applies: 1 - 14 days notice = No refund 15 - 29 days notice = 50% refund less $30 administration fee 30+ days notice = 100% refund less $30 administration feeTRANSFER OF DATES If you would like to transfer your booking to another date the above cancellation policy applies; unless we are able to re-let your booking up to 7 days before proposed arrival. Within 7 day notice refunds and transfers are not permitted.SMOKING POLICY Smoking is not permitted in any units. When smoking outside please dispose of cigarette ends in the marked container.FIRE POLICY Fires are not permitted at any time of the year without prior approval from management. Gas BBQ's are provided for your convenience.PETS Due to native/farm animals and conservation zoning pets are not permitted at Kerriley Park Farmstay.CLEANING To help us keep accommodation costs down please leave your chalet in a reasonable condition. Please wash all dishes pick up litter and report breakages (toys games crockery etc.). Please dispose of soiled nappies and feminine hygiene products in the outside bins (provided). Unfortunately if your chalet is left in an unacceptable state a $35 per hour charge will apply to cover any additional cleaning requirements.